Let me first say this; deep down, I knew that I should have sat this one out. Maybe just volunteered, perhaps just cheered for my friends. 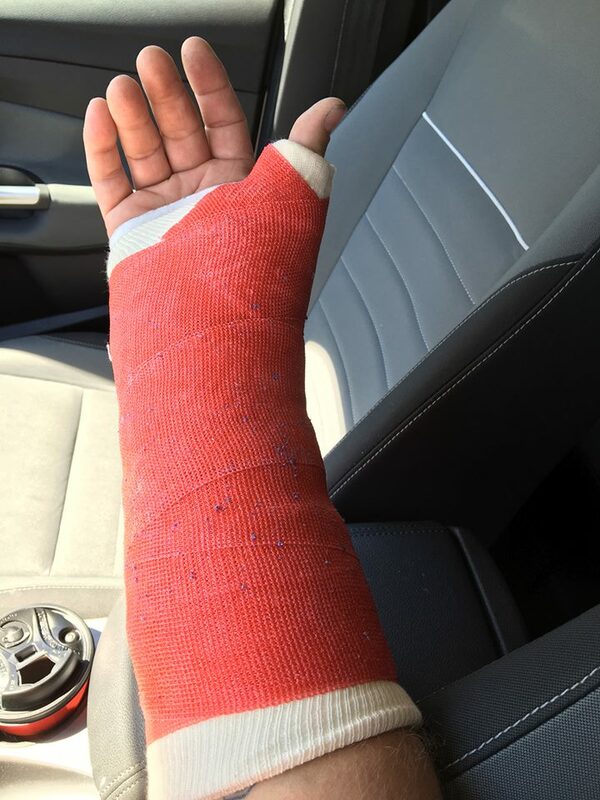 I have had a rough few weeks, starting with a fractured wrist, then it was discovered that I had broken one of those small bones at some point and didn’t know it. So, this is what I’ve been dragging while attempting to train. Surprisingly to me, it drained a lot of energy. I knew that having the extra weight would pull energy, but the injury itself sucked the rest out of me. Needless to say, my training has suffered. Hoof it for Heifer had been sold out for several weeks, but we had planned to go up there anyway and cheer for some of our friends and camp there with them. The week before my wife sent me a text asking if I wanted to do it. It seems that she had found someone who couldn’t make it and was willing to sell us their bibs. I was somewhat reluctant since I haven’t trained much in the last few weeks. I also think the cast may have caused me to alter my gait a little because I had been fighting a slight pull in my right calf. I thought about entering or cheering, decisions, decisions. I did need to get in a training run since I haven’t been feeling great with this extra weight on my arm. It was on a trail, I needed that. However, the doctor had suggested that I not run due to the sweat building up in the cast. Of course I had already broke that rule and was paying the price. What the heck…let’s do this. I was in and ready to go. That is until .4 miles in, the calf started acting up. I decided to push myself until I couldn’t bear it anymore, so I trudged on. After all, I wasn’t even warmed up yet. About a mile in, we entered what is known as the Boy Scout trail. This is one of the most beautiful trails in Arkansas. It is a rugged trail; they advise you to not enter this race if you are a novice trail runner and this is advice that should be heeded. The trail is very technical and offers many opportunities to hurt yourself. One definitely needs experience and confidence to tackle this course effectively. The first aid station is just shy of 5 miles in. I started asking myself if I could make it there. My leg was hurting, my energy was zapped, but I wanted to do this. As I got closer to the station, my leg started feeling better. Not that it quit hurting, it just wasn’t bothering me as much. Maybe it was due to my mental energy going to my right arm and it’s irritant. As I approached the aid station, several people commented about me doing the race wearing a cast. I started to think of how people might get a little hope from me, If the guy in the cast can do this so can I. Maybe that why I was there that day. So I downed some water, topped off my bottles and took off. The next aid station would be around the 9 mile mark, just 4 more miles. JUST! Those 4 are probably the most rugged. At times I wondered if I was running a trail or climbing stairs, but soon it became worth the effort. We got into a small, narrow valley, where you are surrounded by rock walls dotted with caves. Through this, there were several small stream crossings. Normally I don’t stop for pictures during a race, but I had to make one exception this day. 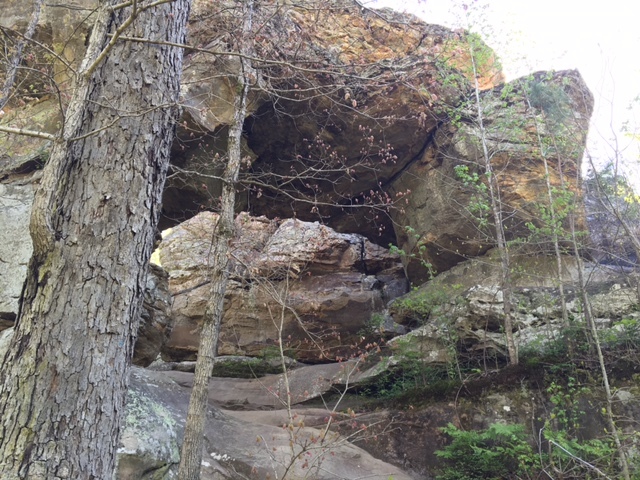 It was when I got to Natural Bridge. All the scenery soon had me forgetting the pain in my leg and the giant piece of fiberglass and cotton on my arm. I was still exhausted, but at least I had some beautiful distractions. At the last aid station, one of the workers told several of us that the last few miles weren’t as bad. I had a little hope that I could finish, but that doesn’t mean it was easy. It was still a tough run, but they were right, it wasn’t as tough as the previous part of the course. The last mile or so you follow a creek. At one point I saw a road bridge ahead and people on the bridge. I wondered what those people were doing watching a bunch of dirty trail runners on a nice Saturday. I hadn’t been paying attention to my GPS and didn’t realize that I was close to the end. When I got to the bridge, I had to climb some stairs made of railroad ties. Once at the top, turn and head to the finish only 1/4 of a mile away…uphill! There are no breaks in this race, only challenges. I felt completely exhausted and ready to sign up for next year.